Pack your pajamas because homegrown mattress brand Skyler is throwing a sleep-themed slumber party to celebrate the success of its Hong Kong launch. The party will go on from 1pm to 6pm on May 27 and 28 at its showroom in Wong Chuk Hang. There will be milk and cookies, a midnight bonanza and a fun, sleep- inspired photo-booth. Buy a mattress during the party and get a HK$1,500 discount. All you need to do is RSVP on www.skyler.hk to join the party. Specially made for Hong Kong's environment, the mattresses are designed for warm and humid climates with infused cooling gel and breathable Coolmax fabric. They have a firmness rating of seven to eight out of 10, offering maximum support and comfort without being too soft or too hard. Skyler maintains that each mattress is made with high-quality materials, guaranteed 100 percent safe and will not sink or dip, even after 10 years. High-grade CertiPur-US certified foam materials are used to ensure it does not contain any harmful chemicals and meets the program's strict standards for performance and durability. Mattresses are available in 11 sizes, retailing from HK$5,000 to HK$8,800. The company offers free next-day delivery for online orders, a 100-night at-home trial and full return policy for every order. And then there is the piece de resistance: all mattresses are vacuum packed into a compact box with wheels so they can be delivered to any bedroom easily no matter how small the lift or how many flights of stairs are in the way. Co-founders Jason Da Rosa and Alex Ma embarked on the idea when they experienced the daunting process of mattress shopping in Hong Kong. 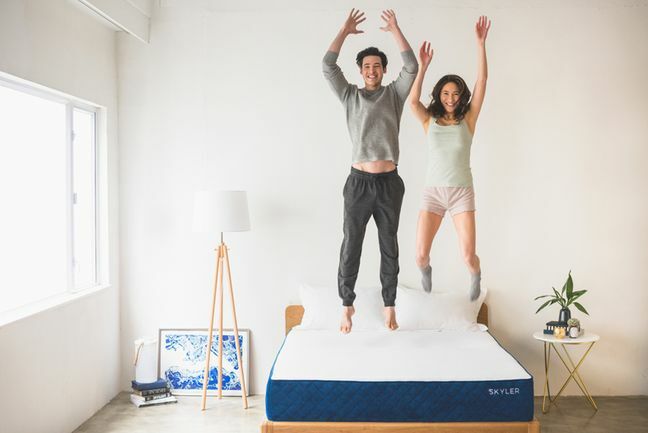 The former bankers began developing their own premium mattress in early 2016, setting out to create a mattress that rivaled the quality of traditional luxury brands but without the price tags. Da Rosa said: "After getting married, my wife and I moved back to Hong Kong from the United States and needed a mattress for our new apartment. We were shocked by how expensive they were here. The same mattress brands cost two to three times more in Hong Kong than they did in the United States. "We realized mattresses were being sold at vast markups in order to cover the high cost of rent for prime retail storefronts in Hong Kong. By selling online, we realized this was a gap in the market we could resolve." Hong Kong's shrinking living spaces was also another problem Da Rosa and Ma wanted to address. Ma said: 'By using the latest vacuum compression technology, we discovered that we could also solve another Hong Kong-specific problem, which was getting a large sized mattress into an apartment even if lifts are cramped and unaccommodating. "All of our mattresses come packed in a compact box with wheels and handles that easily fits into any car, lift or stairway." Every mattress is protected by a 10-year warranty. In addition, customers can give their mattress a test snooze prior-to-purchase at the showroom.